Isn’t it remarkable after 5-1/2 years of massive bombing in Syria, that western media with high-level contacts in the US government still routinely report that entire cities, including hospitals, marketplaces, & residences, were bombed “either by Russian or Syrian warplanes”? The US Pentagon has the most high-tech satellite surveillance system in the entire world. So high-tech that they can watch the assassination of Osama bin-Laden from a war room in the Pentagon or target an individual they consider dangerous with a drone attack. And yet, they dummy up when it comes to who is bombing what in Syria. If Russia & Syria are being falsely accused, Russia also has high-tech surveillance systems–just as sophisticated as the US Pentagon. US media, including the NY Times, never think to question that? Or are they just doing their usual job of obfuscating what the hell is going on because deceit & confusion serve the US political agenda? 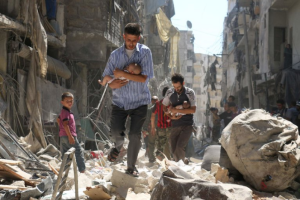 The cease fire in Syria brokered by the US & Russia begins today. Most of the details remain secret & we have to take the word of Russian diplomats that Syria agrees & will comply with it. This is not the first cease fire negotiated between the US & Russia for Syria. Kerry, under advisement from Henry Kissinger, brokered one in September 2013, two years before Russia entered the war militarily. It isn’t that these negotiations & cease fires are just political theater but that they are politically fraudulent. What is really being brokered in secret are devil’s pacts & intended to confuse antiwar forces who have not disappointed in the depth of their confusions. The devil in these pacts is in the details of the secret parts. What antiwar forces should be able to agree on is a demand that the cease fire be permanent on the part of all military forces now intervening in Syria. No to US, Russian, & Syrian bombing. These men are rescuing babies after an airstrike in Aleppo yesterday. Media reports say either by Russian or Syrian bombers. Today Muslims around the world celebrate the festival of Eid al-Adha (Festival of the Sacrifice) celebrating the willingness of Ibrahim to sacrifice his son. It has a particularly cruel irony for Kashmiris who are not celebrating but instead grieving & burying their beloved killed by the Indian occupying army. In the past 66 days of the siege, they have buried 84 people, some from pellet injuries, some from live ammunition, some from being beaten to death, some from other violent causes. 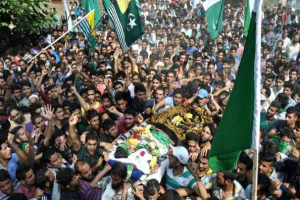 This is the funeral yesterday in Srinagar of Javaid Ahmad, a 23 year-old man who died in hospital from being shot in the leg by soldiers on August 5th during a protest at Narbal. It took a while to determine that he wasn’t Javaid Ahmad, the older brother of 30 year-old Shabir Ahmad Mungoo, the teacher brutally beaten to death by soldiers on August 19th in midnight house invasions in Khrew. Two brothers of Shabir named Zahoor & Javaid were among the many others severely beaten & both were treated in hospital for multiple broken bones. There is no report that either Zahoor or Javaid died from their injuries. But there are reports of how violent those home invasions in Khrew were, including drunken soldiers carrying knives, iron rods, & axes. It would be a mistake to attribute the reign of terror to drunkenness since it was almost certainly orchestrated from military headquarters to terrorize & as a form of collective punishment. 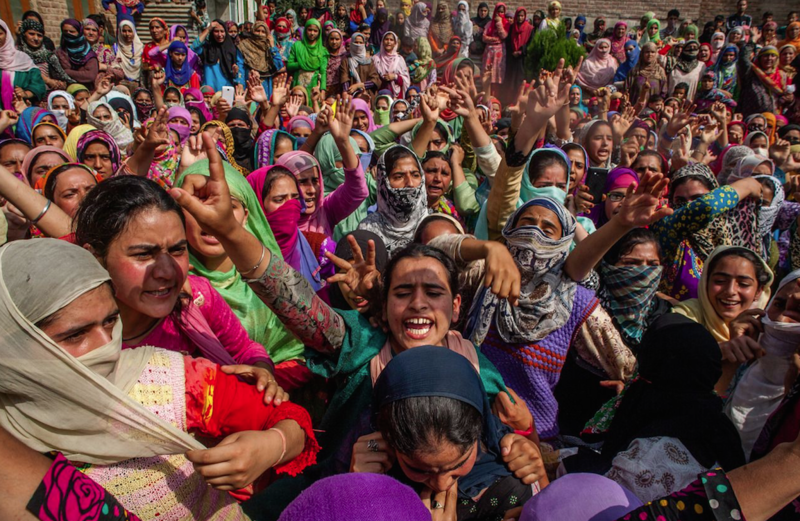 Such gruesome rampages are the realities of the Indian occupation of Kashmir. 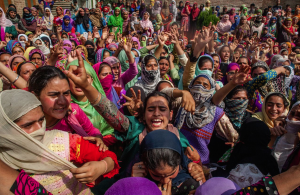 The top photo of Javaid’s funeral from Yahoo was headlined “Tensions continue in Kashmir,” “Tensions” is such a delicate & altogether dishonest way of describing a brutal military occupation. 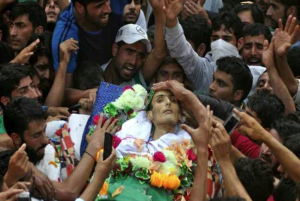 The two bottom photos from Kashmiri media show the funeral cortege/protest accompanying Javaid’s body to burial. Our sincere condolences to the families of all who have lost sons & daughters in this barbaric siege. May the deceased Rest In Peace. Long live Intifada. End the occupation. Self-determination for Kashmir. 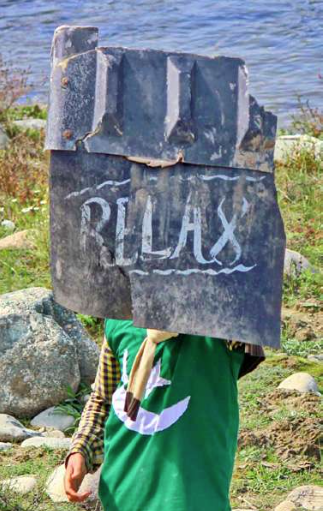 Today, Kashmir Reader published an article about how Kashmiri youth protect themselves from harm against pellet guns, pepper spray, tear gas, & PAVA grenades, & other weapons. They use swimming goggles & discarded x-ray films as body shields. Some are also experimenting with tire rubber & other materials to defend themselves. One of the young men interviewed in the article said he learned about using x-ray sheets for protection from a Palestinian friend on FB. The point is not that these are sufficient protection from injury or death against the armaments of one of the best-equipped military forces in the world, but that the spirit of defiance against occupation is so powerful that protesters go up against that military unarmed & undeterred by the dangers. That spirit & the creativity of determination is what the occupation army is trying to destroy when it disables, blinds, & injures thousands of protesters. This is the anniversary of his death in 1977. We should take a moment to honor him & all those who fought & lost their lives to the struggle for a world rid of racism, injustice, & social hatred. They weren’t all murdered but most spent time in jail for their commitment to human freedom. Our deepest respect. The Miss America contest is the only thing on TV tonight other than reruns of “Murder She Wrote.” It’s appalling but almost mesmerizing to watch intelligent grown women act like Barbie Dolls. Feminists had these spectacles figured out a long time ago. They’re the human form of livestock shows. There are lots of objectionable things about them like objectifying women, the requisite big blonde hair & all the prosthetics involved, promoting competitiveness between us, making groveling for attention, flaunting & exhibitionism feminine virtues. But to my mind, the worst–bar none–is the infantilizing of women. Their model of female perfection was the ideal of the 1950s that we were expected to live up to so it’s no wonder our generation of the 1960s was the one that protested these damn things because we well knew that behind the glamor was the obedient wife in house dresses & the squalor of women’s degradation. There’s been some progress though. They don’t manufacture house dresses anymore.